My favorite dish from Taormina, Sicily. A lovely village high above and overlooking the Mediterranean that has everything going for it. Neat as a pin and the food is their pride. I fell in love with the place. 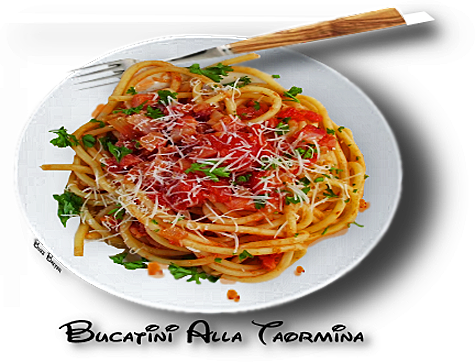 The pasta dish is from mainland Italy and is best known as "BUCATINI ALL'AMATRICIANA". Named for another small village called Amatrice. A spicy dish that will warm you up yet fill you up. I like it with a minimum of sauce and tomatoes so as not to hide the taste of the pancetta. tomatoes through a food mill to remove their seeds and skins. You will have about 5 cups of tomato puree. Reserve. **NOTE: IF YOU ARE USING MARIO BATALI'S RECIPE FOR SAUCE,  SKIP THIS STEP. pancetta is crisp, about 15 minutes. Remove the pancetta with a slotted spoon and reserve. pepper, and red pepper flakes. Simmer gently for 30 minutes, stirring occasionally with a wooden spoon. 1. You can use a recipe for Mario Batali's basic tomato sauce,  which is excellent and I use it all the time.